While looking for craft ideas on Pinterest I stumbled upon lots of cool jewelry made with Shrinky Dinks. I totally forgot about those! I never tried them as a kid but they looked like something that would work in my Cricut Explore. I went to Michael's to get them and I found there's lot of different kinds. I ended up getting the white printable pack. They were more expensive than the other ones but I had a coupon. I always have a coupon. For my first project I wanted to make a birthday gift for a friend at my powerlifting gym. We both crochet and powerlift, which is some what of a strange combo. So we joke that we need to make club for the crocheting powerlifters. I designed us a sweet logo, then lightened the colors by 50% as it said to in the instructions. It looks really weird, but I promise it turns out okay. 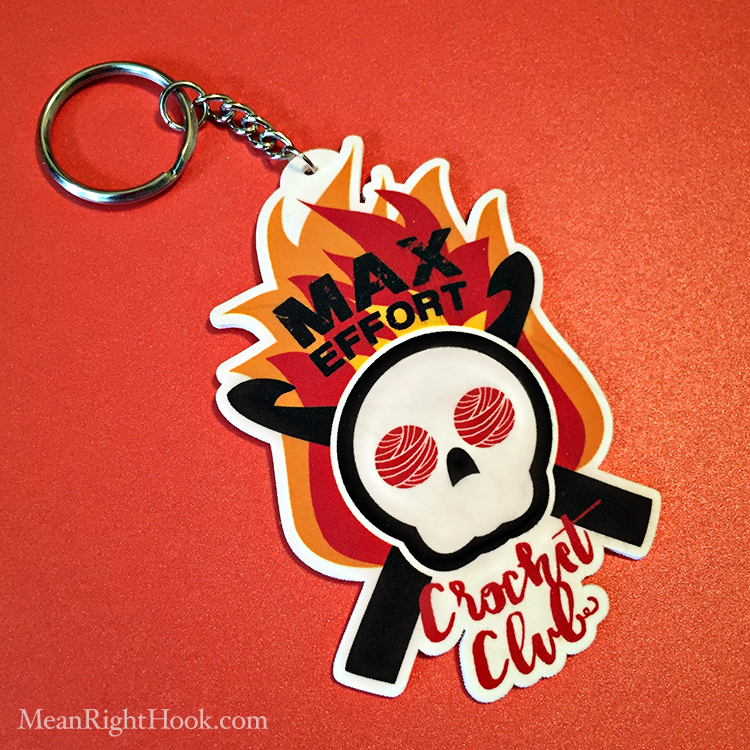 Then I uploaded it into Cricut Design Space. I also added a 1/8" hole to the top so I could add a keyring later, but a standard hole punch would have worked too. 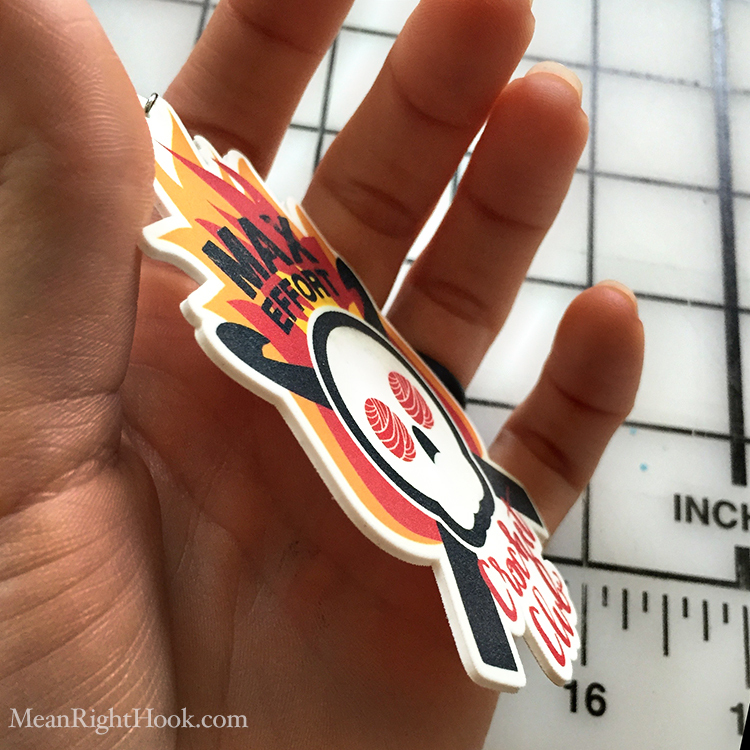 For cutting the Shrinky Dink material I made a custom material setting. I cranked the cut pressure to 340 and changed the multicut to 3x. I used my standard mat and standard blade for cutting. I hit GO and printed my design on the material and proceeded with the cut. It cut out really well. There was just one or two places where it didn't cut all the way though but it was really easy to snap right out. I then followed the instructions on the Shrinky Dink package on how to bake it. I set my oven to 350°, lined a cookie sheet with parchment paper and baked it printed side up. The instructions said to bake for 3-5 minutes but mine took a few minutes longer to completely flatten out. I'm so happy with how it turned out! Just to be safe I added a layer of matte acrylic sealer over it to make sure the ink doesn't wear off. I also cut out a cute little gift bag to put it in. 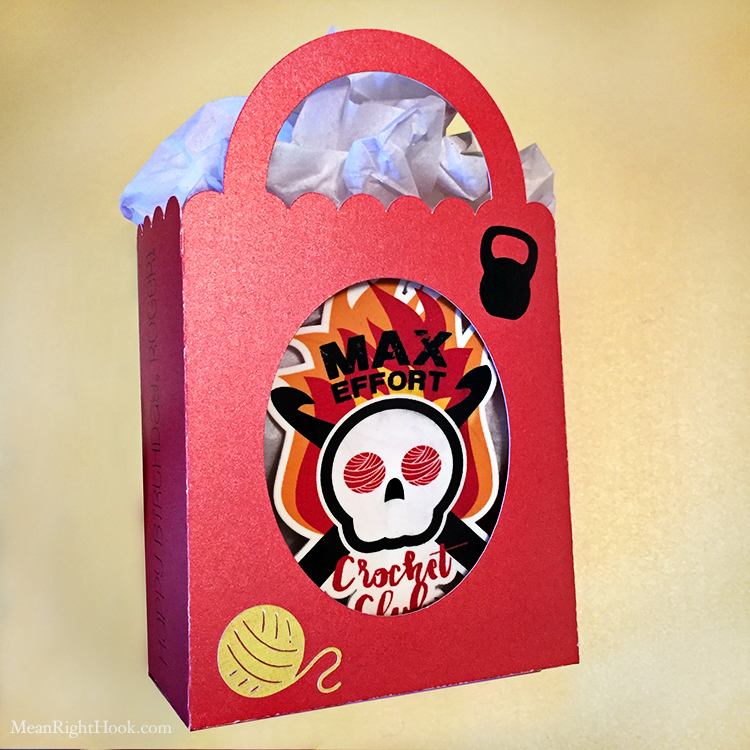 I found the bag design in the Cricut subscription of images. This made a really affordable and easy gift. I can't wait to make more things out of Shrinky Dinks! I've got to make up for all the time I never made them as a kid.